So it's been a little over a week now that I've had to get reaccustomed with the wee hours of the morning. By 5 a.m. I'm trodding heavy-lidded into the kitchen towards the smell of my morning fuel. I don't know what I would do without a coffee pot with a timer. Seriously. Not a day has gone by that I haven't made a plan to take a nap once all the kids are out the door. And not a day has gone by that I have actually followed through with that plan. I mean, 2½ hours later? I'm awake by then. The coffee is pumping through my veins...three children have been fed and groomed...the morning air feels cool and welcoming. And best of all, it's now time for mama to eat some breakfast. I've always been a breakfast lover. It doesn't necessarily have to be a lavish breakfast. It could be a container of yogurt. It could be a bowl of cereal. It could be a piece of fruit. Occasionally it's even a slice of cold pizza. Once in a while it's an all-out affair that is sure to hold me until dinner. And I'm sure I've said it before, but often times, it's eggs. I love how you could (hypothetically) have a different egg dish every day for months on end. Could. Huevos Rancheros are a simple dish that goes together very quickly...especially if you already have some blender salsa hanging around in the fridge. I made a salsa for this version since I (oddly) didn't have any around...but you could use any type of salsa that you enjoy. It doesn't have to be this one. Give a few tortilla a quick dip in some hot oil and then fry up a couple of eggs and wham-bam-thank-you-ma'am. Place tomatoes, garlic, both types of chiles, dried onion, and cumin in blender. Add a drizzle or two of water. Puree until fairly smooth, adding enough water to make approximately 1½ cup (or a little bit more) salsa. Season to taste with salt and pepper. Pour enough oil in the bottom of a small saucepan to make a very light film, about 1 tablespoon or so. Turn heat to medium and when hot, carefully pour in salsa. Bring to a boil, then reduce heat to a slow simmer and allow to cook for 5-10 minutes. Hold over the lowest flame you can produce (just enough to keep it warm). In a small skillet, heat about ¼-inch of oil until very hot. One at a time, slide the tortillas into the hot oil to make pliable, 30-45 seconds total, flipping tortilla halfway through. Remove to a paper towel-lined plate. Blot with another paper towel and set two of the tortillas on each plate (or all four on a larger platter), overlapping slightly. Heat about 1 tablespoon of the butter in a small, nonstick skillet. Once the butter has melted and started to foam a bit, crack in two eggs. Cook, basting with the melted butter in the pan until cooked to your liking for Sunny-side up (or however you'd like your eggs). 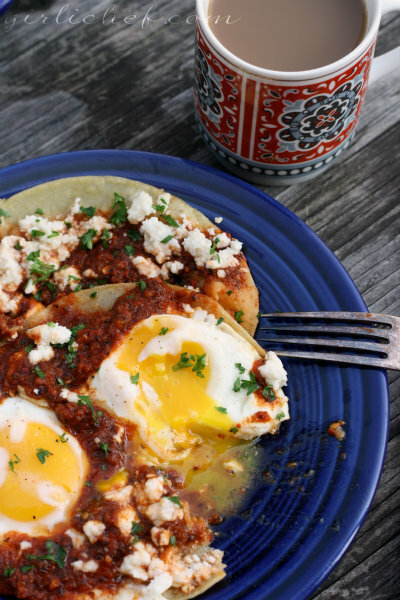 Slide onto one half of the tortillas and repeat with remaining eggs and butter. Sprinkle with salt and pepper, if you wish. Carefully ladle the warm salsa around the eggs onto the tortillas and egg whites. Sprinkle with queso fresco and parsley (or cilantro). Enjoy! They look delicious! I am a huge fan of breakfast. Guess the year starts all over again...can't believe it. Waking up to this, I'm pretty sure I'd get up any time, bleary-eyed and all. I never order Huevos Rancheros because they are always doused with beans and I HATE beans. Your version, I'd eat in a heartbeat! 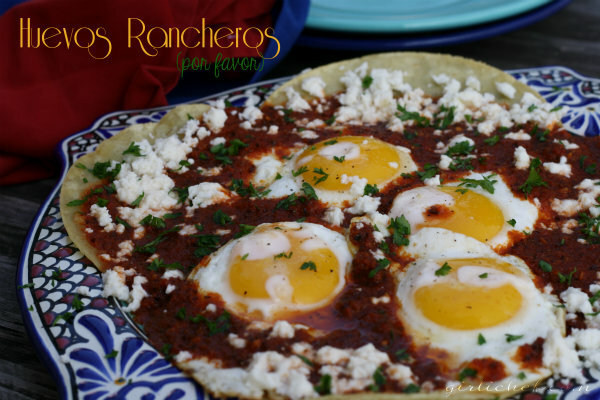 Huevos Ranchereos are my husband's family's breakfast favorite. In fact I had not heard of it until I met him. Your recipe looks fabulous! I loooove huevos rancheros. So very much. These look delish! This looks amazing! Thanks for sharing on Foodie Friends Friday! Don't forget to come back and VOTE on Sunday! If it weren't for breakfast I'd probably never get out of bed! The promise of these huevos would have me up in a jiffy though. 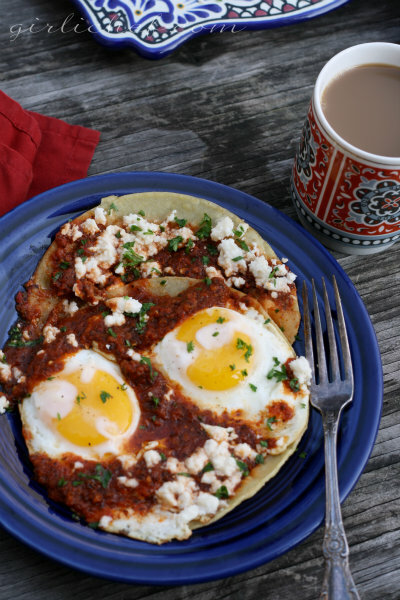 I love huevos rancheros, and this version sounds divine! Thanks for linking up! this looks good. thanks for sharing on Foodie Friends Friday and hope that you join us again this week with another great recipe or two or three. I am also a breakfast lover~ could eat breakfast for every meal. Hubby loves a huge plate of huevos rancheros!! amazing pictures! !